In reference to yesterday's diary entry about the vulnerability in the Mambo content management system, we received several confirmations that it is being exploited in the wild. An ISC reader supplied us with a captured attack packet, which demonstrated an attempt to upload a copy of a PHP-based backdoor (Loader'z WEB Shell) to the vulnerable system. Thanks to Rick Hoppe for the pointer to the fix. Although we initially reported that some versions of PHP may not be vulnerable to this attack, the Mambo Development Team has revised their assessment to state that all versions of PHP are vulnerable. They also point out that the flaw "is not specific to Mambo and has not been totally blocked in Joomla, as can be verified in the Joomla forum." The fix listed on the Mambo forum "can be applied at the entry point to any PHP application that may be vulnerable, including Joomla." Joomla is another PHP-based content management system. This, along with other security issues, is addressed in Joomla 1.0.4. If you applied the Mambo fix yesterday, you may want to revisit their forum, because they've updated their recommendations since originally publishing them. Please send us your feedback regarding the effectiveness of this signature, and we'll be sure to relay your commends to Bleeding Snort. Did I mention that from all files, the big pack one called pics.exe, rep.exe, 1004270.exe, YSBAgree.exe and iS.exe, only the rep.exe is alreayd identified by some AV vendors at VirusTotal? So...be careful and pay attention...! As I sent them to my personal AV vendors email list, most of them are already detecting them! Good work! 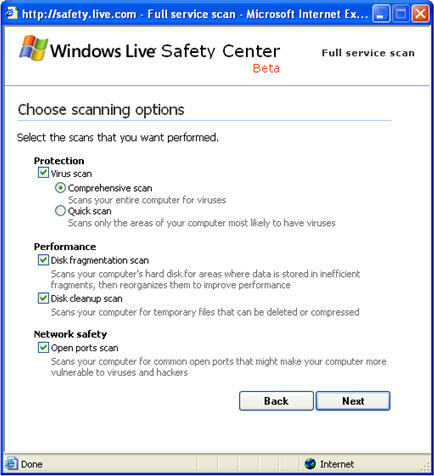 A couple of weeks ago Microsoft revealed a beta version of its free on-line security scanning tool Windows Live Safety Center. The scanner, which currently requires the use of Internet Explorer, uses an ActiveX control to scan the visitor's system for malicious software, open ports, as well as for non-security performance issues. The screen shot below shows the tool's scanning options. 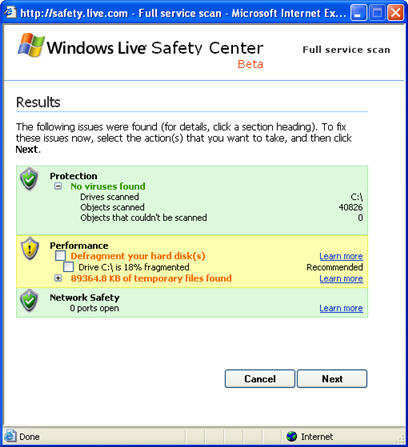 Windows Live Safety Center is reminiscent of Microsoft's free Windows Defender tool, formerly known as Windows AntiSpyware. I've been beta-testing Windows Defender for some time, and I find it quite good at detecting and blocking spyware threats, especially because of its behavioral blocking functionality that automatically blocks suspicious actions on the local system. The on-line scanner doesn't provide such continuously-monitoring features; however, its performance tuning and anti-virus functionality is very similar to the Windows OneCare service. Windows OneCare, which is still in beta, "runs continuously in the background, offering persistent, always-on security protection and PC maintenance that generally does not require any action on your part," according to the recent Windows OneCare newsletter. Windows Live Safety Center offers similar functionality, but rather than offering continuous protection, it is an on-demand service. While I was writing this note, Windows Live Safety Center finished scanning one of my laboratory systems. No viruses were found, but it looks like I'll need to defragment my hard drive. By the way, today marks the twentieth anniversary of Microsoft's release of Windows 1.0, according to the 20 Years of Windows article from Desktop Pipeline. What a fascinating journey! Whenever researching information security issues via a search engine such as Google, I am often presented with numerous marketing-oriented pages from security product vendors. Sometimes this can be useful, but usually what I want to see is information from technical resources, such as security mailing lists, articles, and papers. That's why I am experimenting with a custom-crafted search engine that one can create via the Rollyo service, which allows you to limit your search to specific sites of interest. This search scans security articles, blog entries, and mailing list posts; the current list of scanned sources is maintained on my website.